You can save print settings as a favorite and use it when printing. 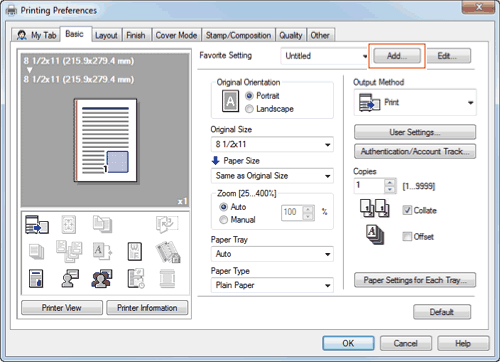 When you save a frequently used combination of print settings as a favorite, you can easily apply all of those settings by selecting the combination from the Favorite Setting list, even if the combination is complicated and contains settings on multiple tabs. 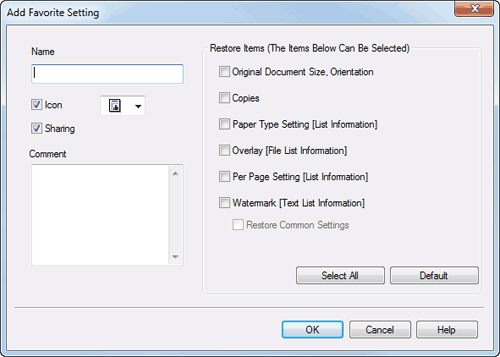 • Restore Items: Typically these settings are determined when you start printing (such as the original size and the number of copies). By default, these items are not saved as part of the favorite setting. As necessary, you can specify them as items to be saved.